SKU: ve038. Category: Elvis Velvets. Frame options - select from the drop-down above. 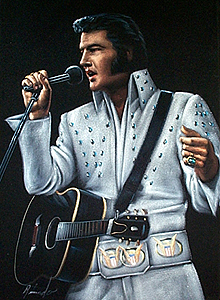 Not sold anywhere else, Incredible ELVIS in White Jump Suit Singing into the Microphone with his Guitar – 2003 EDITION created by The Velvet Store. Signed by top of the line artist Ricardo. 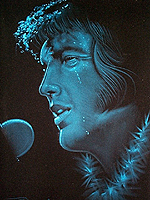 If you love Elvis or know someone who does, this is a must have for any collector. This piece has it all, white jumpsuit, mic, and guitar!